Pastor Maldonado continued his run of competitive form in this afternoon’s Canadian Grand Prix qualifying session. In his first F1 experience of the Circuit Gilles Villeneuve, Pastor set the 12th fastest time of the session. 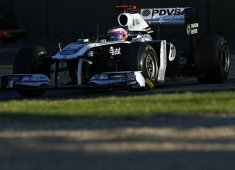 Rubens Barrichello meanwhile was hampered by a technical issue and ended up in P16. Both drivers will start the race with a fresh set of super-soft rubber and in the knowledge that anything can happen in Montréal. We weren't quick enough for the top ten today but Pastor did well to get the most out of his car. He probably could have gone better but he ran out of KERS on his fastest lap as we weren’t able to re-charge it quickly enough. Rubens had some brake warm-up issues on his car and so he wasn’t able to get his best lap together. This race always presents opportunities, however, and the team will be pushing hard for more points. I got 100% out of the car this afternoon so I’m happy with my qualifying performance. For sure it’s better to be in the top ten, but there are plenty of variables expected in this race. Our pace is good and the field is very close. We are not too far from the points and, with overtaking possible here, there’s every chance we can have a good day tomorrow. I think it’s going to be an exciting race. Unfortunately, we had with a problem with the front disc in Q2. It wasn’t coming up to temperature so the car was pulling to one side and eventually caused me to go off the track. In the end, it cost us a lot of time and forced us to change our strategy. We actually have a very good car that is capable of better things but there are overtaking opportunities here, and we have the pace, so there is every reason to be positive for a strong race.